Job cuts are usually the first thing that spring to mind when artificial intelligence is mentioned, but AI can be used by online retailers to save a packet without firing anyone. The use of machine-learning by retail giants such as Amazon for tailoring websites to reflect consumer tastes is relatively old hat, however, one little-known German e-commerce retailer has taken use of AI technology to a whole new level by forecasting future trends. Hamburg-based Otto has harnessed a deep-learning algorithm, which was originally designed for particle-physics experiments at the CERN laboratory, to make substantial savings on the sale of its clothing, furnishings and sports equipment products. 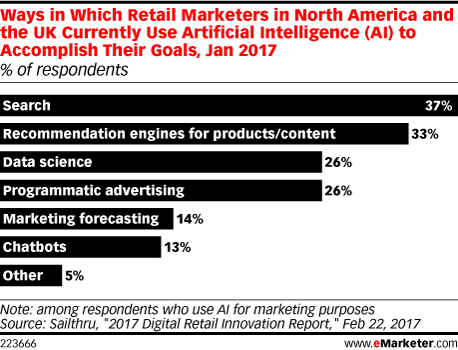 Although widescale AI adoption is still in its infancy, there’s a growing number of retail marketers who are using the technology for jobs that could previously have been carried out by humans. Forecasting is one of the emerging areas of automation among retailers and at Otto the move to AI is already beginning to deliver results. Research has shown that customers who have to wait more than two days to receive their order are far more likely to return it - forcing the vendor to forgo the sale and swallow the shipping costs. Another turn-off for customers is when items are sent in multiple shipments. Rather than looking to improve existing forecasting carried out by staff, Otto has addressed these issues by creating a system that analyses around three billion past transactions and 200 variables (such as past sales, searches on Otto’s site and weather information) to predict what customers will buy a week before they order. So far, the success of Otto’s AI system has been quite remarkable. It predicts with 90% accuracy what will be sold within 30 days, meaning the company feels comfortable enough to automatically purchase around 200,000 items per month from third-party brands with no human intervention. Overall, the surplus stock that Otto must hold has declined by a fifth, while product returns have been slashed by more than two million items per year. A lot has been made of threat to jobs posed by AI, but robots in the workplace also present an opportunity to create new roles for human workers. Rather than laying off swathes of its staff, Otto instead went on a hiring spree as a result of its new algorithmic approach. The combination of the AI system and specialist staff has brought about increased productivity, meaning Otto customers are now getting their orders sooner and are therefore more likely to remain loyal to the company. Looking to the future, the AI revolution will almost certainly lead to the creation of new jobs in science, technology, engineering and mathematics (STEM) fields like nanotechnology and robotics. Robots will inevitably suffer glitches, need updates and require new parts. As companies rely more and more on automation, they will require more people with technical skills to maintain, replace, update and fix AI technology. A 2011 study by the International Federation of Robotics found that one million industrial robots directly created nearly three million jobs, while a more recent study published last month states that less than 10% of jobs are fully automatable. There will of course be some human collateral damage as the development of AI technology gathers momentum, but there will also be opportunities aplenty for those who are prepared to embrace a changing workplace.